Actor Vicky Kaushal's response to former India cricketer Virender Sehwag's post is unmissable. Sehwag was at his quirky best as he took to Twitter to praise the film on surgical strike. Actor Vicky Kaushal’s response to former India cricketer Virender Sehwag’s post is unmissable. Sehwag was at his quirky best as he took to Twitter to praise the film on surgical strike. He used an iconic dialogue from the film for the post which reads, “How’s the Josh? High Sir. 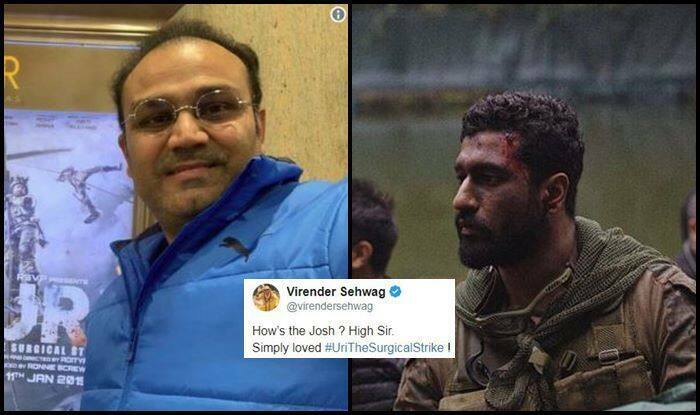 Simply loved #UriTheSurgicalStrike !” It was Sehwag’s tweet that got noticed by the leading actor of the film, who responded to it in a heartwarming manner. “Day made! Thank You Sir,” Vicky Kaushal wrote. The film is based on the surgical strikes that India did on Pakistan as a response to their earlier attack on Uri, where innocent soldiers and the common man lost their lives. Yami Gautam is the leading lady in the film. From being bold to being quirky, Sehwag is a ht favourite on social media for his light-hearted tweets. Sehwag watched the movie on Wednesday and also clicked a picture with the poster of the film in the backdrop. The film has already grossed Rs 63.54 crore in six days and is expected to breach the Rs 100 cr-mark over the weekend. It surpassed the Rs 50 cr-mark within the first five days of the release.